Thales Canada along with The Government of Canada and the provincial governments of Ontario and Quebec has announced an investment of $25 million (Canadian Dollar) in a public private partnership project. Named, ENCQOR, it is a $400 million (CAD) public-private partnership for ultra-high-speed communications infrastructure that will focus on research and innovation. 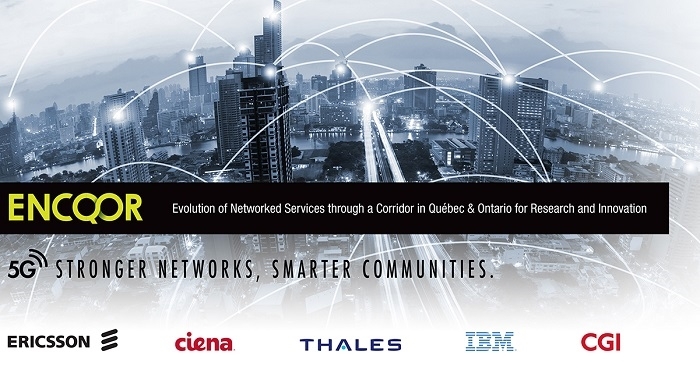 ENCQOR (Evolution of Networked Services through a Corridor in Québec and Ontario for Research and Innovation) is meant to bring together governments, small and medium businesses, and academia to link research facilities and laboratories across Eastern Canada to collaborate on 5G technology development and create Canada’s 5G communications superhighway. Thales pushes the boundaries by connecting people every second, every day, everywhere. With download speeds up to 100 times faster than current 4G technology, 5G and ENCQOR will transform the capabilities of Canadian businesses to compete in the global marketplace. ENCQOR will secure more than 4,000 jobs in Canada, including 1,800 specialized 5G jobs, over the next five years. Of these, Thales will secure more than 800 jobs in Quebec and Ontario including approximately 40 specialized jobs in 5G. Thales will leverage its leading R&D investments to drive 5G technology developments; securely moving data at the fastest speeds to drive the evolution of our world-class urban transportation solutions, secure connectivity capabilities and cloud-based big data analytics. In the last three years, Thales has invested over $1.5 billion (CAD) in key digital technologies with the launch of its high-tech Digital Factory in Paris, cortAIx in Montreal and recent acquisitions of technology leaders Vormetric and Guavus. This activity brings together experts who support the injection of big data and artificial intelligence into Thales solutions, while also ensuring data security – a fundamental requirement of the modern digital economy.